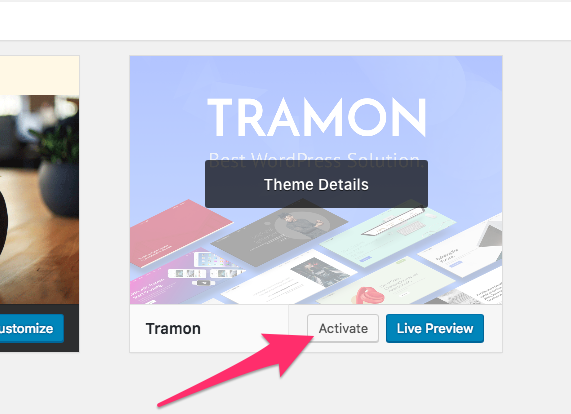 Welcome to the Getting Started guide for Tramon Theme, please you can take a look at the information below to start using the theme. So you've purchased our theme and you're ready to get started-- great! When you purchase a Tramon license from ThemeForest & download the theme package, you will receive a zipped folder titled "themeforest-xxxxxxxx-tramon...". Unzip this first folder. Within the unzipped theme package, you will find a number of folders such as design, license, etc. There is also 1 additional folder within, titled "Theme". Inside this folder is the ZIP file with the actual theme, this file is called "tramon.zip". 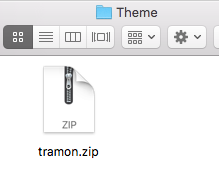 Important: DO NOT unzip this "tramon.zip" folder! This particular .zip folder should remain zipped. That's the ZIP file you have to upload to install the theme. Click "Choose File" > find your zipped "tramon.zip" file > Click the "Install Now" button. If you receive this error message, please be sure that you're installing the ZIPPED file titled "shopapp.zip". The theme includes plugins that you should install and activate to enable certain options. Note: these screenshot are for demostration purpose, your theme may not need all the plugins in the screenshots. Just follow these steps and the theme will know which plugins to install. Optionally, you may install our demo data, which will populate your site with the pages you see on our live demo. This can give you a head start in setting up your site. Once you get your site setup and get the hang of it, you may delete the unwanted posts or pages as you see fit. 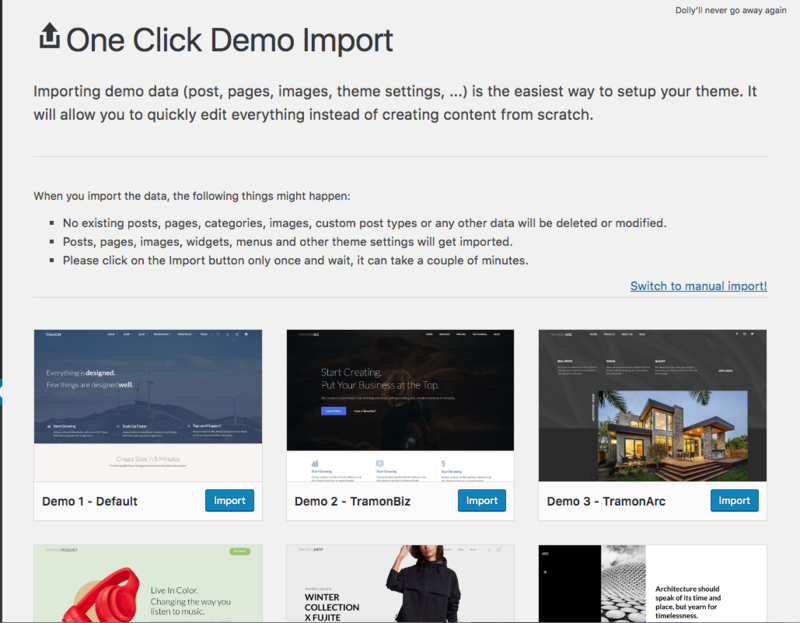 You can download only the XML Import File if you want or you can use the One Click Demo Install, this way with just one click you get the same site that you see on the demo. For this, first make sure you have installed the One Click Demo Import plugin. You can follow the instructions in Recommended Plugins to install this plugin. There you will see all the demos aveilables, you can click Import on the one you want. This may take a few minutes, just wait until it says it is done. Note: All the images were replaced with placeholders, this is to make the import process much faster and to avoid copyrights issues with the images. 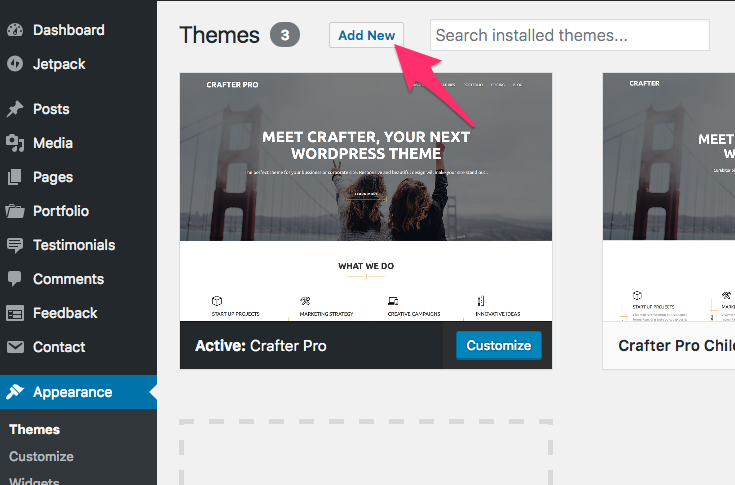 All theme’s options are in the WordPress Customizer Appearence > Customize. Here you can select things like the styling colors, change typography and much more. All color options are in Appearence > Customize > Colors. Select the color you want and then click on “Save & Publish”. Using a Child Theme has many advantages, for example you can do any modifications you want to the files without loosing them on future updates.